I am attaching a picture of the pantry moths I collected in my pantry. Clean, Odor free Pantry Pest Moth Traps. 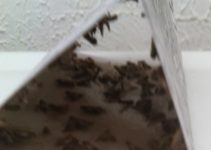 Catchmaster pantry pest moth traps are very effective, clean, and odor free. I’ll be placing another order so I have the traps on hand next time my groceries come with moths. It is nice to find moth traps that really work. I had tried several other brands, but nothing works as well as Catchmaster. 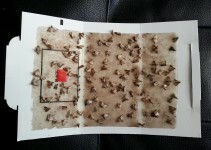 Becki, I found the pictures helpful when I was choosing brand of moth traps. That pheromone lure must really work because each trap seems to have the moths concentrated near the lure..
seems like it would be better to put the lure in the ‘middle’ section. Maybe some moths got away along the upper edge?